Anyone who has played competitive sports will recognize the importance of confidence in being a successful athlete. When I was playing competitive basketball, confidence made a world of difference. Why would anyone ever drive through the lane when there are sometimes five opponents guarding the hoop? 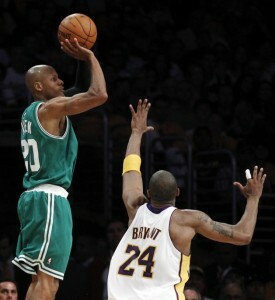 Confidence often gives us the push to either drive or shoot or attempt to block a shot. When players go into a “shooting slump,” coaches will tell them to keep on shooting and trying because they are trying to build confidence in their player. You have to get back up on the horse, right? Last night I was playing basketball with some friends after a longer hiatus than I care to admit. Back in the day I played ball nonstop and was far more likely to be on the court than on a computer blogging. I was a baller, after all! But I noticed last night that one of the changes in my approach to playing ball was in the area of confidence. When I was 20, I would drive on anyone, use the crossover on anyone, and attempt to block every shot that came my way. Fourteen years later, I’m just trying not to die from either tripping or having a asthma attack… and I don’t even have asthma! My confidence is all but gone. (1) As leaders, our confidence is not in ourselves but in God. Being a leader is hard sometimes. Most pastors that I know of are constantly having to address issues or people that require some form of confidence. If our confidence is in ourselves, than we generally address those issues or people from a self-focused perspective that is often concerned with self-preservation. Yet if we approach those issues and people with the confidence that we are in Christ and empowered by the Spirit that was poured out on Christ’s followers, it’s much easier to “take it to the hole” so to speak. I had almost completely forgotten about this situation. And I’m very thankful that the Lord graciously worked throughout the entire process to bring repentance and restoration. But it reminds me of something that I do remember. Quite frankly, the only reason why I even came close to moving forward on addressing those issues that this person references was because I had a God given confidence in Christ. I just knew that God would honor his Word and that the Spirit was going to work throughout the entire process. My confidence was in God and the gospel. At the time when this confrontation and discipline was carried out, I had very little experience and very little training. Those are ingredients, in my life, for a complete lack of confidence. Yet I remember that during that situation, I had a lot of confidence in God. That’s important for church leaders. (2) Confidence will be lost and confidence can be gained. I’m pretty convinced that if I keep playing basketball I’ll get my confidence back. I can still dribble well and have a decent post game but most of my lack of confidence comes from the simple fact that I’m out of shape and much slower than when I was younger. But… I can get back in shape, which will help my speed. I’ll never be as fast as I was in my twenties, but I can get faster. Leaders make mistakes. I’ve made many, many, many mistakes as a leader and I know that I’ll make more. That’s why I’m suggesting that confidence will be lost in your life as a leader. It’s in those moments of feeling like I’ve totally blown it where it becomes really easy to lose all sense of confidence in God and my calling as a pastor. But that confidence can be gained back. How so? By looking to Jesus and remembering the nature of the gospel. One of the most important stories in the Bible on this issue is found in the conversation that followed Peter’s denial of Jesus. In that conversation, found in John 21:15-20, Jesus restored Peter back into the ministry of serving God’s people by teaching and shepherding. This is amazing. Peter denied Jesus three times!!!!!! That seems pretty serious. And yet Jesus loves him and recognizes Peter’s love and points him in the right direction. When I have failed and my confidence is gone, I look to Jesus. (3) Confidence is not the same thing as arrogance or pride. There is a serious differences between the “confidence” found in athletics and the confidence I’m referring to as a Christian leader. A lot of the “confidence” that I had as a young high school basketball player was pride. This pride made me arrogant in how I played basketball as well as how I interacted with other players. As I stated previously, our confidence is in God, not ourselves. Having confidence shouldn’t be the same thing as being and arrogant jerk. Yet that’s exactly what some people say when you accuse them of being arrogant. People sometimes say, “I’m not prideful, I’m just confident.” Hmmmm. Did you see that? Confidence is in the Bible! And it’s rooted in the humility of Christ’s cross. Not only can we have confidence to approach God when we need help, we can have confidence to leave behind sin (Heb. 12:1-2). What do you think? What would you add about the role of confidence in leadership? How can we take this too far or not far enough?